This blog post is dedicated to Ri and Rae. This Beauty Blogger and I have been exchanging many messages and shared a few personal stories. In October 2009, she posted an article on tipping which showed the cutest Getty image of a squirrel. 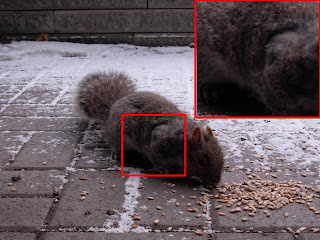 That led me to confess my adoration of the displayed rodent and how I... grocery shop for squirrels. She thought that was hilarious (and probably also thought I should be institutionalized and kindly omitted to mention) and replied she'd use it in a blog post; which she did (first paragraph). I grocery shop for squirrels because they amuse my cats when they come for their feeding. I know it's awful because that teaches them they don't have to hunt for food, but I very much prefer feeding them sunflower seeds than having them take my trash out of the can and sparingly spill it across my lawn. 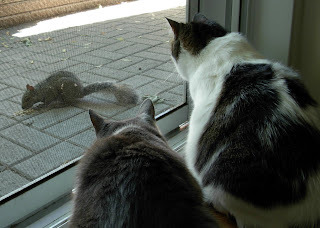 I recently posted an article (Dr. DoLittle) in French about a squirrel who had come to my bedroom window to take his final rest. I noticed a melted patch of snow when I first glanced out the window at 6 am one morning. When I opened the blinds later on, I saw that a squirrel was resting there, in the middle of the snow. I brought him to the vet for incineration later that day. He'd passed away right there, not even 2 feet away from my bedroom window. The long story, in French, is that I am an animal lover and animals love me. It comes naturally to me. An insurance salesman came to meet at my place earlier this week and, after being greeted by my oldest cat, asked if I had other cats outside (no - I don't let my precious babies out and about!). He'd seen 2 cats on my lawn. Earlier tonight, I counted five sitting on my balcony (one is MIA in the pic). The cats literally come to my window. I don't know if it's to tease my indoor princesses or because they too, feed on sunflowers and my garbage like the squirrels, but they adore my home. The squirrels come to my patio door and, if they see me, some of them will actually climb the screen door and shake it to get my attention. That drives the cats wild. The pictures of the black and white cat is a common scene when I walk into my living room at night. A cat that is not my own is sitting on the window ledge, looking inside my home. It has also occured on many occasions when squirrels will do the same however; I have not been able to capture the moment yet. If you thik I'm ecstatic now, wait until I see my first groundhog of the year! I often feel like Snow White must have felt. I walk out to my car and squirrels follow me; stray cats come to me for a quick neck rub. You can call me Mrs. DoLittle, although Snow White sounds much more flattering. Posted by Miss IPP at 6:49 p.m. Makeup Mama March 2, 2010 at 7:09 p.m.
Wow, that is a lot of cats outside in that pic! Lol. I used to feed squirrels regularly at my old place and they called their friends to reap the benefits, as well. I only stopped feeding them when they tore holes into my screen door (5 holes to be exact) trying to get into the house. And the only thing that stopped them was my neighbor's cat "Monster" who liked our place, too. He kept them away after that. All those animals seem to love your generous nature...I guess I know where to go if I'm ever hungry! Miss IPP March 2, 2010 at 7:34 p.m.
Rae // theNotice March 5, 2010 at 1:51 a.m.
Aww! You make my day ^^ I wish animals loved me the way they love you -- most of the time, they can't run away fast enough! On a vaguely related note, I saw a squirrel while out for a walk this afternoon and thought of you! It was an angry squirrel, though, screaming at another little squirrel. (I promise that is not why I thought of you, LOL!) I could just imagine it: "How dare you!! I saw you with that trollop from around the corner last weekend!! And you call yourself a family man!"